The reason for this name is that the springs quality is like a rich beauty serum. Jindai spring is a sodium hydrogen carbonate spring which used to be called a sodium bicarbonate spring. The springs have great effects such as Muscle ache, Rehabilitation, Scars, Skin problems and so on. 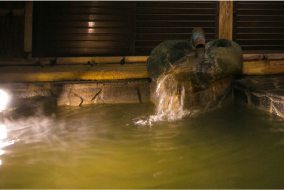 The Jindai hot spring experience makes you great fatigue recovery. 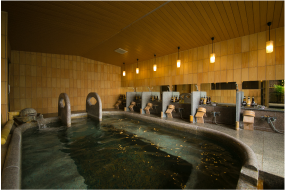 you will enjoy the beautiful seasonal surroundings and the hot spring exclusively. Please make a reservation at the reception desk on the day you visit. Some guest rooms have exclusive open air baths with deck chair. These open air baths and rental open air baths are famous natural hot springs known as a spring of beauty. You do not have to consider other guests or time. Indulge yourself in the springs whose quality is as rich and smooth as you please. Some guest rooms have exclusive open air baths with deck chairs. 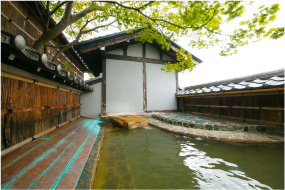 These open air baths are famous natural hot springs known as a spring of beauty. You do not have to consider other guests or time. Indulge yourself in the springs whose quality is as rich and smooth as you please. © Copyright Hanaougi Bettei Iiyama All rights reserved.